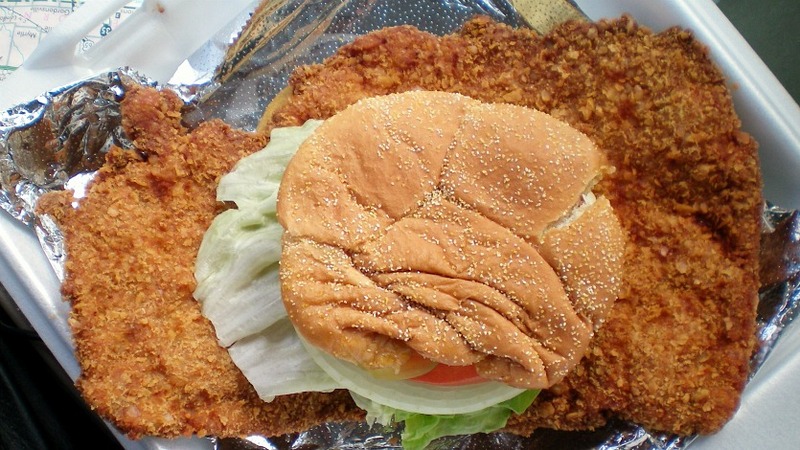 An article in the Mason City newspaper alerted me to a small town sports bar with a big tenderloin in the hamlet of Thornton up in Northern Iowa. I walked inside to be met by a giant banner proclaiming "We have the biggest loins....", so I knew I was in the right kind of place. Location: 324 Main St in Thornton, in Cerro Gordo County, Northern Iowa about 90 miles north of Des Moines. Directions: You take exit 180 from I-35 and drive 2 miles into Thornton, Main St and Westy's is just north of the train tracks. The Tenderloin: The loin itself was pounded thin, and took up the entire to-go box, making the bun and fixings look extra small. It formed a loosely triangular shape, and although thin it maintained a good amount of juiciness. The breading had the usual cracker crunch, but little seasoning to speak of. 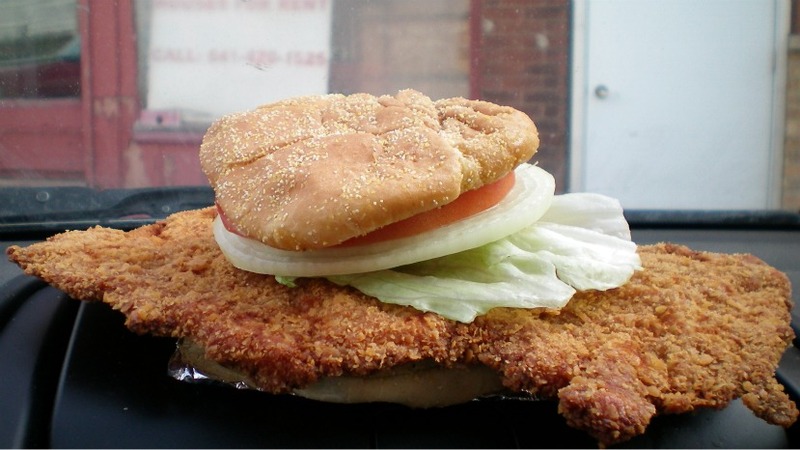 Served with lettuce, onions, and tomato on a corn-dusted bun. Overall 8.0 out of ten. Price: $6.00 a good value. Also on the menu: The menu was small with burgers and chicken, and Thursday is Taco Night. 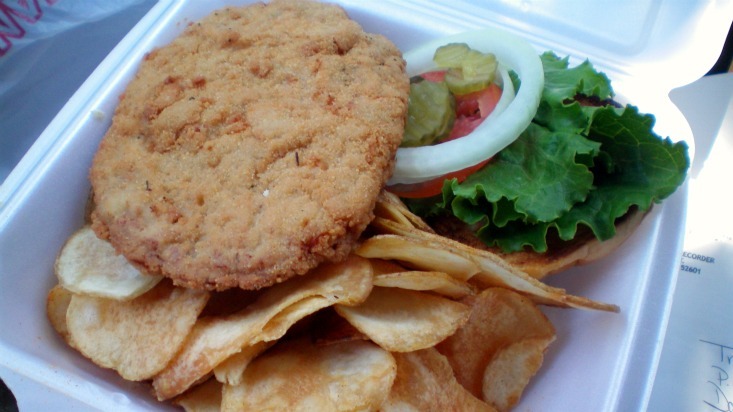 The restaurant was promoting its hamburger for the Best Burger in Iowa contest by the Iowa Beef Industry Council. Service: I came in during the off hours, there was just one guy running the bar and the kitchen. Ambiance: Its a small town sports bar with team banners, Chicago Bears stuff, televisions, and a bar or tables for seating. Final Thoughts: The stretch of I-35 between Ames and Mason City or Clear Lake is one lonely stretch of road with few good options for the hungry traveler. Once you pass the Gilbert exit in Story County its like a dead zone with few options other than truck stops and fast food. 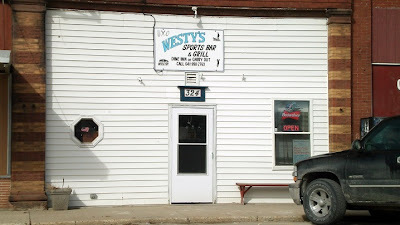 Westy's and its tenderloin are not going surpass the Suzie-Q in Mason City as the best loin I have found in this area. 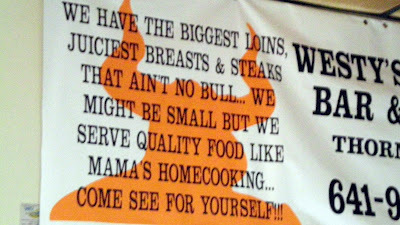 It is a good large loin for a reasonable price, and close to the Interstate as well. The Longest Yard Sports Grill is a low key neighborhood sports bar that seems to be named for a 1974 Burt Reynolds movie. 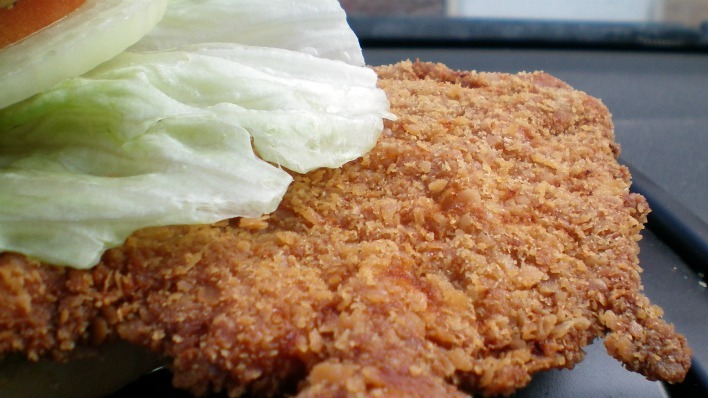 I had seen signs at this bar telling me of hand breaded tenderloins on Mondays while walking through Valley Junction in the past few years, but never made it here until a few weeks ago. 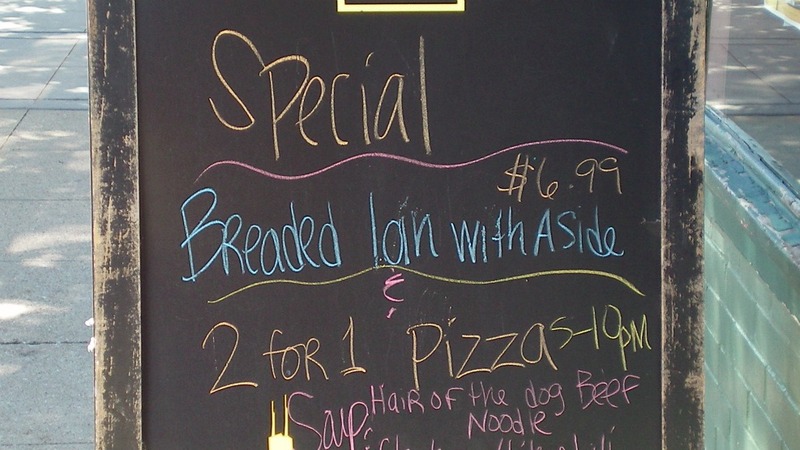 I must have thaught they only serve these on Mondays, but they are on the menu every day. 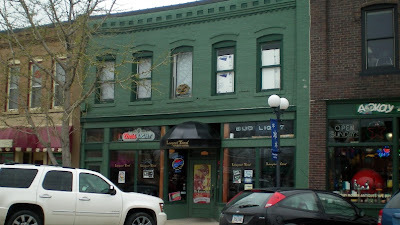 Location: 122 Fifth Street in Historic Valley Junction, West Des Moines. Its between a bunch of antique stores, across from the Atomic Garage. Directions: You get here by taking 63rd to Railroad and turning north of 5th St.
Online at: the website is down, but they have a facebook page here. 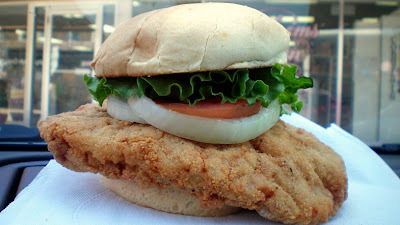 The Tenderloin: This sandwich felt like it was a good seven or eight ounces of pork in between the bun and the fixings. The pork was hot steamy white meat which had been pounded out well. 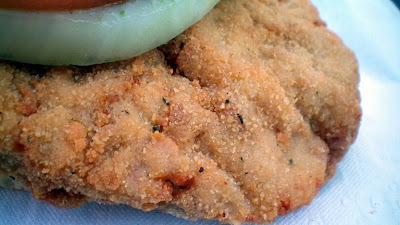 The breading had just the right amount of seasonings to give a good aftertaste, along with a great crunchy texture. Served with all the fixings on a toasted bun, overall 7.84 out of ten. 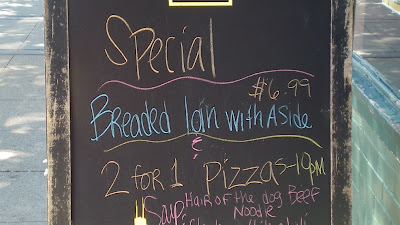 Price: regularly $7.99, but on special Monday for $6.99 with a side. I opted for the homemade chips, which were tossed in seasoning salt. Tenderloin is also available grilled. Also on the menu: Burgers, nachos, pasta, something named Hayden Chili Fries and the usual sports stuff. The drink specialty seems to be a beer served in a three foot high glass. Service: Its table service or sit at the bar. It was attentive when I came by early on a Monday, the food takes a while to prepare. Ambiance: This is a Hawkeye Bare with photos of visits from Jim Zabel and autographed stuff from former Hawks. The place feels like a small town bar with high ceilings, exposed brick and woodwork, and dim lights. Final Thoughts: This is an okay sports bar with an above average tenderloin. Its like visiting a small town pub and grub right in West Des Moines. My eternal quest for new and untried breaded pork tenderloins had always failed to find them in West Des Moines. The local Maid Rite around the corner, Paula's, had a sign advertising a tenderloin as "Best in the Junction" but would serve up a frozen preformed loin. Maddy's used to serve a good tenderloin in this neighborhood before moving out by Jordan Creek. I am still looking for undocumented tenderloins in and around Des Moines, if anyone can let me know, leave a comment somewhere on the blog.